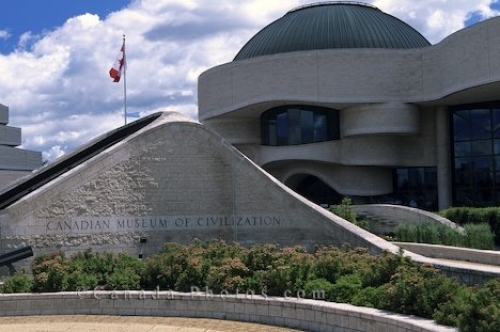 The building that is home to the Canadian Museum of Civilization has a lot to offer tourists that visit Quebec, Canada. A fascinating place to learn the heritage of the Native People of the West Coast and the artifacts that belonged to them as well as the history behind Canada. There are three floors to explore with each one having a wide variety of displays. Musee Candiens des Civilisations, Canadian Museum of Civilization, Hull, Quebec, Canada, North America. Picture of the building that is home to the Canadian Museum of Civilization in Quebec, Canada.